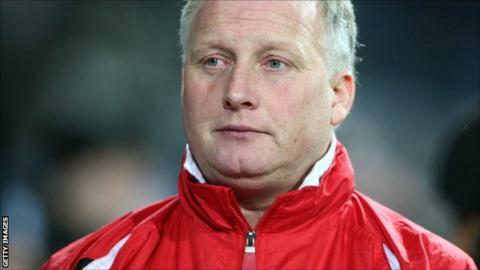 New Bury boss Kevin Blackwell says it was important that his side did not lose their first match under his stewardship at Stevenage on Saturday. but remain bottom of the table and without a win in nine League One matches this season. The 53-year-old former Sheffield United manager told BBC Radio Manchester: "We're delighted with that first point. You've got to start somewhere. "The first thing you do is make sure you don't get beat. We've done that." Substitute Mark Cullen rescued a late point for Bury after Stevenage had turned a 1-0 deficit into a 2-1 lead early in the second half. "We knew it was going to be tough because they play a certain style," added Blackwell. "They're big and strong, and I thought we coped with it well. "I'm just disappointed that, in the end, we couldn't have come away with a win from a game that I think, overall, we shaded." Bury have two home games to come in the space of four days, starting with the visit of Carlisle on Tuesday, to try and register their first victory of the campaign.